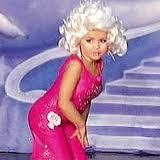 I’ve been thinking about writing some more on the TLC reality show Toddlers & Tiaras. The reason is that my early blog posts regarding the same show or/theme have been read by so many people, and I still get comments and response, so I guess there are a lot of strong felt opinions out there. Some pageant moms have told me to stop watching the show, since I don’t “get” the concept! And I’ve been accused of being a scandal-lover, who looks to Toddlers & Tiaras to find reasons to rail against child beauty pageants. This last comment was today, and it got me thinking. Christie, proud pageant mom, might be right to an extent. I watch the show from time to time, and I rail against the child beauty pageants, and I must say, the TLC reality series consistently delivers. 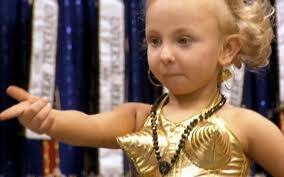 The show follows a parade of mini divas and their attention-starved moms as they prepare to compete. Since its first season premiere in 2009, the show has delighted and disgusted fans as parents dressed their tots and instructed them to act in ways that were, to put the criticisms mildly, not age-appropriate. The series has even spawned a spin-off — Here Comes Honey Boo Boo — about sassy 6-year-old pageant-circuit veteran Alana Thompson, aka Honey Boo Boo, and her self-described “redneck” family. 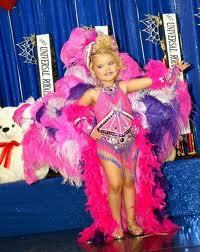 What are some of Toddlers & Tiaras’ most memorable controversies? The latest uproar came when Toddlers & Tiaras mom Lisa Christian sent her daughter sashaying on stage in a Grease-themed costume” — with a candy cigarette in her mouth as a prop! She coached the kid, saying, of all things, “Don’t forget to smoke!” Seriously, “what in the world is she thinking? A cigarette — in a 4-year-old’s mouth?!? The general opinion was of course that smoking and children have nothing in common, and it was disturbing to see a four year old playing the role of Sandy and coming off as smoking is a cool thing to do. For me the problem here isn’t the candy cigarette, it’s the pageants themselves, and the way they’re teaching girls from the cradle that their main value in this world is their looks. 5. Eyebrow waxing: Outright physical abuse? And there you have it. Am I a scandal-lover? Well, I don’t think so, but I don’t mind you calling me that, proud pageant moms... I still will rail against this show, and the business. 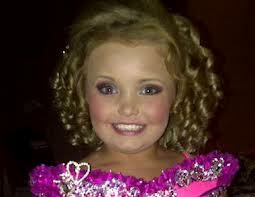 Another week, another episode of Toddlers & Tiaras, and another horrifying act of child cruelty! Now even though the pageant mom who talks in the clip is negative to the prostitute costume, why doesn’t she find it disturbing to put on makeup and hairpieces on her little girl? Or fake tan, fake teeth, fake poses,,,, etc. A huge amount of my ninety-something comments from my previous article about this, have been supporting the show. But I have also had a lot of response from people who can’t believe the bad parenting who is given primetime attention trough this show. One of the comments came from Sheri N from Kentucky, and it was so brilliant that I asked her the permission to repost the comments here, so that more people could read it. “I find myself wishing this show was a sting project by a human ethics/rights group – that the events, severe emotional manipulation, coercion, mental and physical torture these children are put through is not in vain, that their suffering is paving the way for laws that prevent mothers (and occasionally a dad, but most times they are puppets too, afraid to put their feet down and stand up for their children) – from using their children in this horribly inhumane way. The stage moms all say: “Pageants help my daughter’s self-esteem” but in reality, over and over I see how the children react to not winning the TOP prize. Even though pageants add superfluous tittles to ensure most contestants come home with SOMETHING, not a single person is ever fooled by those tittles. They all want the big win, and they are wrecked if they don’t get it. The judges always say they are looking for the “personality, the natural beauties” but inevitably, the winners are the most plastic, freakishly fake dolled-up looking contestants. Behind the scenes of these pageants show the children in various stages of meltdowns, bad behaviour brought upon by undue stress and fatigue. Small children saying things like “show me the money”, and “Shut up, I said SHUT UP”! 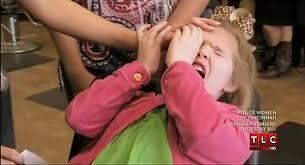 I’ve seen many children slapping their parents and screaming things like “NO I don’t want to” at them. Or trying to hide under an air conditioning unit, or in a corner. These children are acting out their stress over being thrust into this jarring, fake and exhausting, competitive world. Do these parents realize how their children are being shaped into quasi-humans by this unnatural environment? Their natural, normal personalities are being altered so tragically. Rather than building a healthy self-esteem, the children are being trained to be people pleasers; children (and later adults) who are constantly seeking the approval of others. They only get high scores when they are enhanced dramatically and artificially. They are obsessed with how they look and appear. They are not learning to “find themselves” and discover what makes them special. Instead they are trained to morph themselves in to whatever is considered “it” at the moment. These moms are constantly criticizing their children (some more than others) and they may not even realize, but someone needs to tell them! I am so sad for these children. Their parents can put any spin they want to on what they are doing to (they would argue, ‘for’) their children, but in reality, they are losing their children to shadows of their former selves. Thank you, Sheri N, I couldn’t agree more! I wonder how far a reality show can go, when the subjects to the “reality” are small children in a setting who should be far far from their real lives. 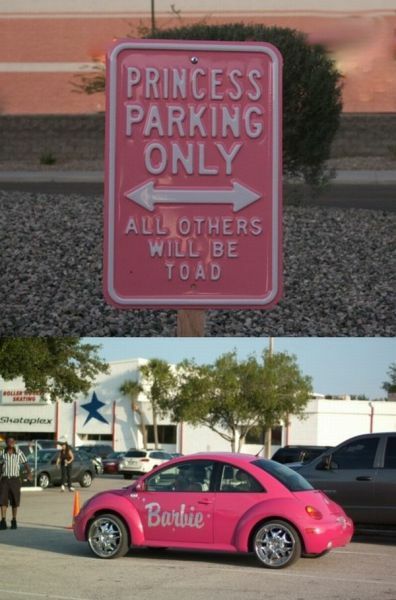 Future parking for the princesses from Toddlers & Tiaras? Beauty pageants became part of the American society in the 1920’s. 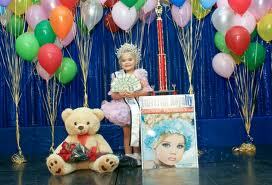 Child beauty pageants began in the 1960’s. 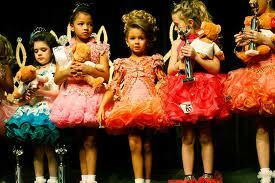 Child beauty pageants consist of modelling sportswear, evening attire, dance and talent etc. The children are judged based on individuality in looks, capability, poise, perfection and confidence. The judges call it, “the complete package”. There are glitz pageants, natural pageants, semi-glitz pageants, face pageants, online pageants, online photo contests, scholarship pageants, and coed pageants. Each type of pageant has its own rules and guidelines. And then there are the unwritten rules that you must know in order to be successful. Beauty pageants originated as a marketing tool in 1921 by an Atlantic City hotel owner who wanted the city’s tourists to remain in town longer. A local news reporter started the infamous term, still used today by saying, “let’s call her ‘Miss America’!” Pageants were introduced into the lives of Americans and became a major event, although they were discontinued from 1929-1932 due to the Great Depression. As the years progressed, pageants served as political, educational and entertaining events. 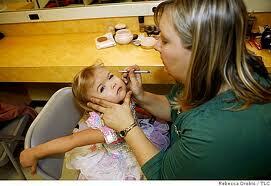 Pageants offered scholarships and helped beneficial programs. Marking a racial breakthrough, in 1983 Vanessa Williams becomes the first African-American titled Miss America. In 1994 the first handicapped woman wins the title of Miss America. The pageantry world helps introduce a face to the faceless troubles of racism, handicaps and illnesses. Pageants are usually operated by for-profit organizations that produce a local, state or national contest that appeal to many age groups for different reasons. Some mothers lie about their child’s age so the child can appear more mature and poised for that age group; now some pageants require birth certificates along with the entry forms to validate age. Beauty pageants are one of the fastest growing businesses in America. The prizes differ depending on the size of the contest; radios, bicycles, grants, cars, cash awards, trophies and tiaras are some examples. There is a fee required in entering a pageant, which may include entry, rental fees, awards, administrative costs and company profits. Participants have other expenses like clothing, hair, make-up and sometimes hiring a make-up artist, travel, food and lodging. Individual beauty pageants set their own guidelines for their participants, since they are exempt from the federal child labour laws (Fair Labour standards Act, 1938). Child pageant contestants are not considered to be “working” children although they receive money and prizes for their performances and practice for hours per week to achieve those goals. In Universal Royalty pageant, the country’s largest child beauty pageant, all contestants receive an award for participating. There are sixty contestants from the age of zero to thirty years old; all divided into different age groups. As soon as the child can sit up on her/his own she or he can enter the pageant. A competition is held usually every few weeks. There is a minimum cost of $545 to enter the pageant, which covers basic entry fees. Another $395 is needed for the maximum options of this pageant. The average cost of the pageant is about $655 which includes the formal wear, sportswear and dance. The average cost does not include travel, hotel and food, which can be up to an extra two hundred dollars. According to several stage mothers participating in Universal Royalty, dresses for sports and formal wear can cost up to $12,000 with a minimum of $1500. The grand supreme winner receives one thousand dollars in cash, ten-inch crystal crown, six-foot trophy, supreme entry paid in full to nationals, tote bag, satin rhinestone banner, teddy bear, bouquet of long stem red roses, gifts, video of the pageant, and photo on advertisement of beauty pageant. The participants are also required to bring gifts to the winning king and queen. Different beauty pageants offer optional competitions inside the pageant, like decorating your door, dad competition and talent. In Universal Royalty, family values are enforced. Therefore, the dad competition is free of charge and there is a fifty-dollar award and a plaque for the winner. Based on the competition, the child is judged differently, points are scored in each domain of the pageant, and the most overall points earn the participant the grand supreme prize. Prizes for overall photogenic are prejudged from photos sent before the pageant. Each part of the competition has an entry fee to participate. Annette Hill is the director of Universal Royalty, she believes in an organized and professional competition. Annette was a former child pageant competitor, and also had her daughters participate. When she decided to open a pageant of her own, she wanted something different. She enforces family values by making a dad competition, which includes the fathers in the competition as well. Usually the mothers are the controlling authority over the competitors. The inexperienced mothers seem more pleased with any award the child receives at the pageant and less critical of the child’s mistakes on stage contrary to the experienced moms who seem more disappointed than their child to receive a lower-classed award than imagined. “There is no chance for a mistake”, as said by Annette Hill on her own pageant. Preparing for the pageant requires time and patience, hair lasting around an hour and forty-five minutes, make-up around an hour. Different performances for every pageant require some participants to practice for about seven hours a week. William Pinsof, a clinical psychologist and president of the Family Institute at Northwestern University said, ” Being a little Barbie doll says your body has to be a certain way and your hair has to be a certain way. In girls particularly, this can unleash a whole complex of destructive self-experiences that can lead to eating disorders and all kinds of body distortions in terms of body image.” Traveling, stress and competition are everyday aspects of an adult’s life, an average day of an adult requires at least these three aspects to make it to lunch hour, but at the age of eight, stress about body ideals, modelling, and trophies should not come into existence. Since there are no set rules concerning promoters, organizers and participants, pageants are neglected by laws governing them. Organizers want to earn money and are not concerned with the need to protect their participants, and they don’t. According to the Child Abuse Prevention and Treatment and Adoption Reform Act, child abuse is defined as, “the physical or mental injury, sexual abuse or exploitation of a child under circumstances which indicate the child’s health or welfare is harmed or threatened.” Most stage mothers claim that their child wanted to enter the pageant on her own. Does an eight-year-old girl know what is best for her? 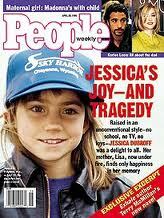 In 1996 seven-year-old Jessica Duboff died when her parents allowed her to fly a plane across the country because she liked it. Should parents rely on their children to know what is best for them? Child abuse is defined as exploitation of a child, are these parents exploiting their child beauties? On a study done by Hillary Levey who researched child beauty pageants of the two to six age group for the Harvard University Gazette, she interviewed forty-one pageant mothers who participate in an average of five pageants per year. Levey concluded that mothers of lower-income and education enter their children in pageants because they want their children to learn the proper skills necessary to move up the social scale. One stage mother said, “I want my child to be aware that there’s going to be somebody better than her. It’s a hard thing to learn, it was for me, and I want her to start early.” Parents with higher incomes and education beyond high school often justify pageants by explaining that competition is essential for their children to become successful. According to Levey, the upper class mothers want their daughters to become lawyers, doctors or to have professional careers. 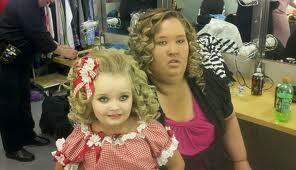 The families we follow in the TLC program “Toddlers & Tiaras” take their children to glitz pageants. Laws and regulations are needed for this arena; organizers, and worst of all, parents are manipulating innocent kids. Mothers take their kids and live vicariously through them. In order to improve the inadequacy of pageant regulation, every state should pass the bonding law, which states that a deposit is required for new promoters to assert the security of the participants. This only exists in a few states. There should be guidelines for the hours of work on stage, practice and travel. Organizers should be required to attain a certificate allowing them to work with children. Make-up and hair should be limited as to not enforce sexuality in such a young age. Beauty pageants are one of the fastest growing industries in the United States. The government should regulate such an extensive enterprise, to provide safety, especially since it deals with children. The government protects the juvenile’s health from smoking and drinking and provides education and safety. Children have rights and laws guarding them against manipulative adults, aren’t these pageants a marketing tool aimed at children? 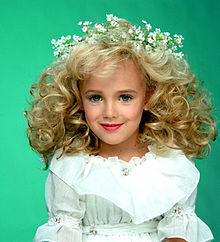 JonBenét Ramsey’s death influenced the public to believe that all pageants promote sexuality and mistreatment, but there are always two sides to every story. Throughout this research, pageants proved to be both a negative and positive influence depending on their surroundings. 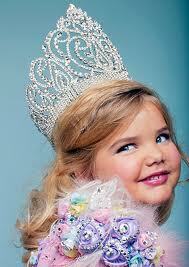 Pageants that regulate make-up usage, sexuality and competition are recognized to be positive experiences for children. For example, Beatriz Gill a child pageant director and a former child participant, does not allow make-up or snug costumes in her pageants. Beatriz is one of many that have a positive outlook on pageants; she believes that pageants helped her become confident and self-assured. On the other hand, many of the pageants do allow excessive make-up, hair and clothing. 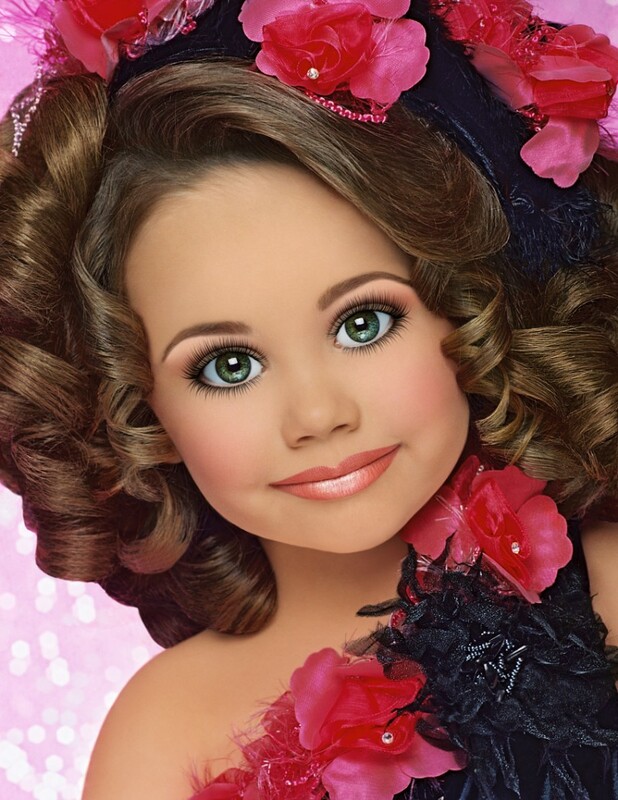 These are the pageants that are exposed in the program “Toddlers & Tiaras” and are the grim examples of an industry that makes money and explore children. 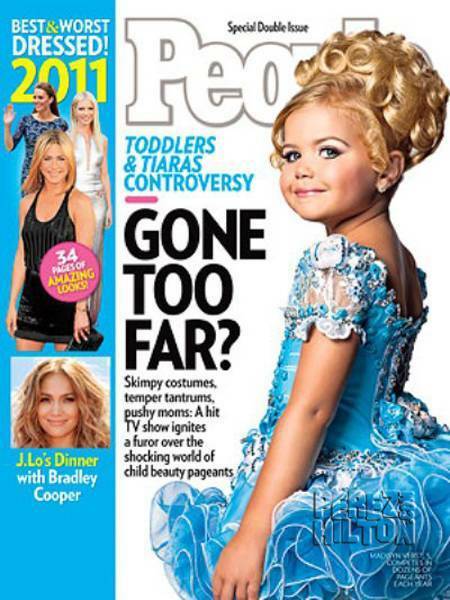 The front page of People magazine that asked if Toddlers & Tiaras had gone to far, started my writing about childrens beauty pageants. Trough out this research I’ve found that my opinion stays. I believe that pageants have a long road before achieving a safe environment for children without introducing them to competition, sexuality and disappointment too early in life. I browsed true some magazines today, and this made me shake my head in disbelieve. 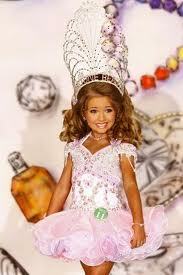 “Toddlers and Tiaras” gone to far? In case you’re not familiar with the show, it features girls and boys as young as four as they prep and primp for glitzy, high-pressure kiddie beauty pageants. The little girls are dolled up with fake eyelashes, caked on makeup, they put in “flippers” = fake teeth, they are painted with spray – on tans and they all have a “hairpiece” that is synthetic hair extensions. Viewers gawk as stage mothers pump their kids with energy drinks and the girls themselves strut around in skimpy outfits acting like mini-divas. Aside from TV stardom, the contestants are vying for a tiara, as well as $12,000 in cash and prizes. So the question asked by People magazine must be the understatement of the year.